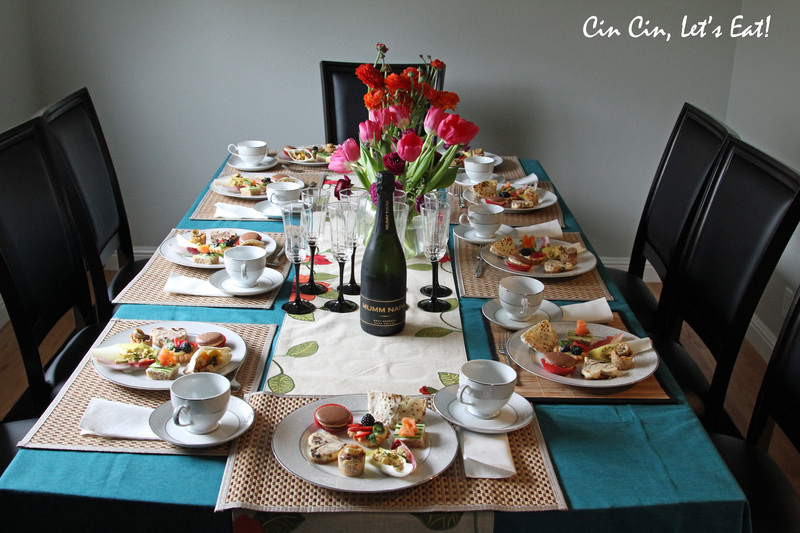 Tea Party 2012 [recipes] – Cin Cin, Let's Eat! 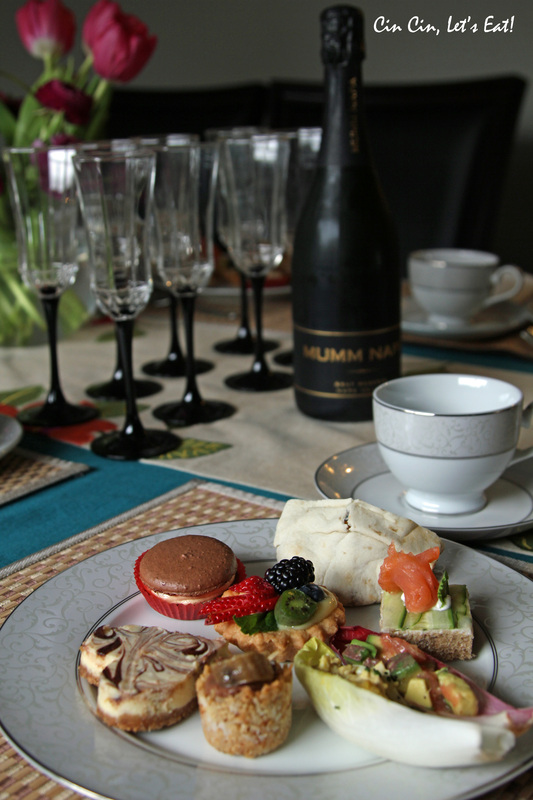 I love to host tea parties for my family and dear friends, and it has become a nice yearly tradition where we stuff ourselves silly with all my creations and experiments. This is when I try to go all out and prepare a ridiculous amount of finger sandwiches and miniature sweets for a co-ed guestlist. Gotta make ’em pretty for the girls, but make a lot of them for the boys. It’s also a great time for me to test my skills and push myself to see how much I can accomplish. 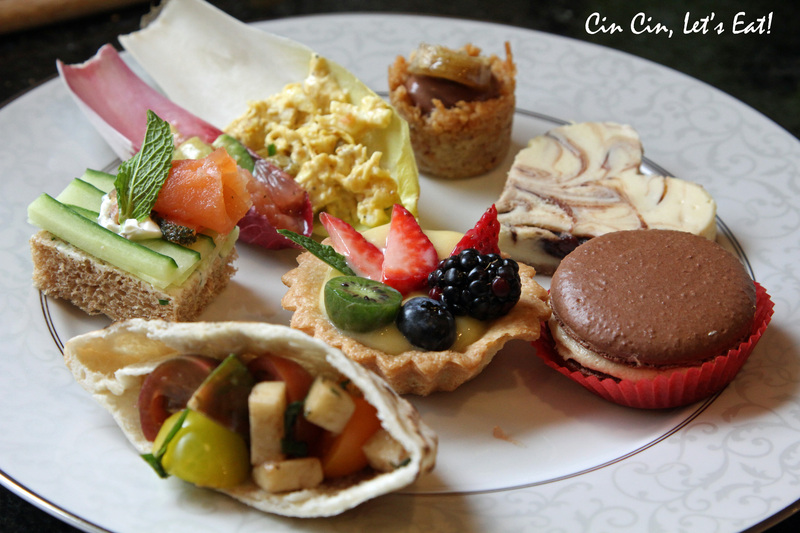 Check out last year’s tea party pictures! 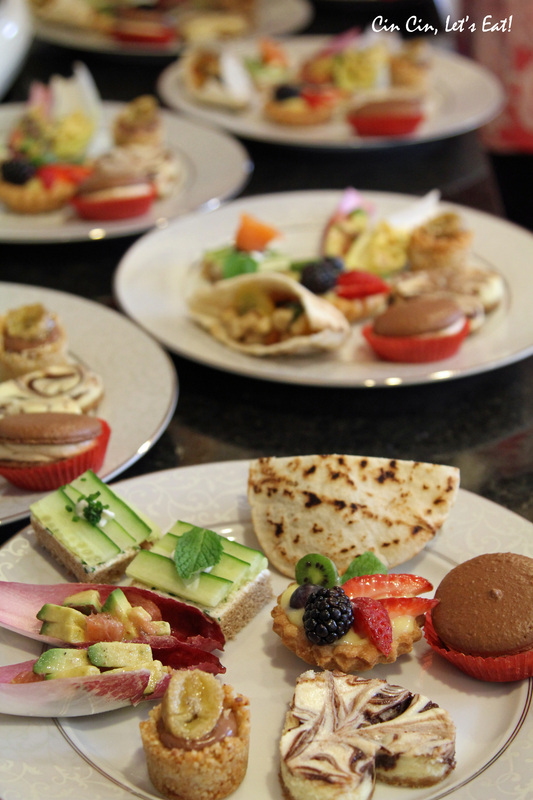 For this year’s annual tea party, I decided to do a plated tea instead of laying everything out like a buffet. Wash cucumbers. Cut the cucumbers into sections of the same length as your bread slices. Using a mandolin set to the thinnest setting, slice the cucumber length-wise. Once thinly sliced, slice it again-dividing it in half, length-wise down the center. You should end up with two long strips of cucumber. Neatly place the slices of cucumbers on bread, slightly overlapping each slices. Cut off 4 sides of crusts, then depending on your preference, cut the sandwiches into 4 squares, 2 rectangles, or even smaller triangles. 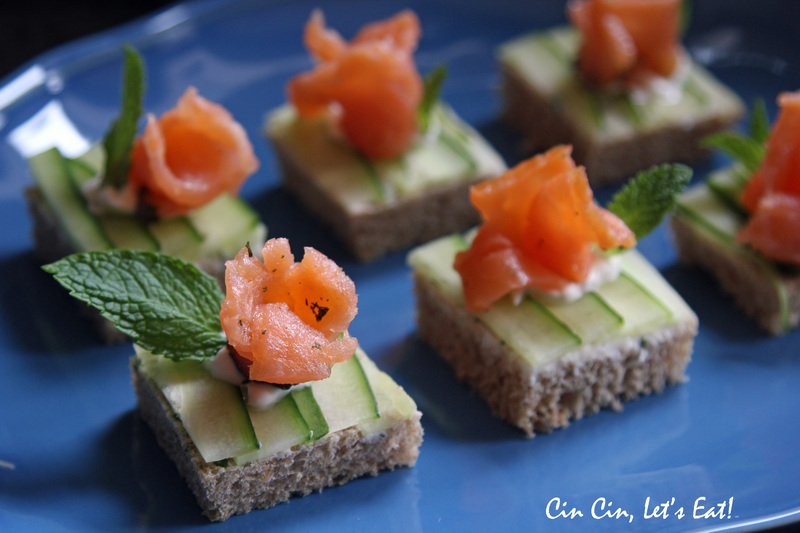 curl up small slices of smoked salmon to make a rosette-like shape. 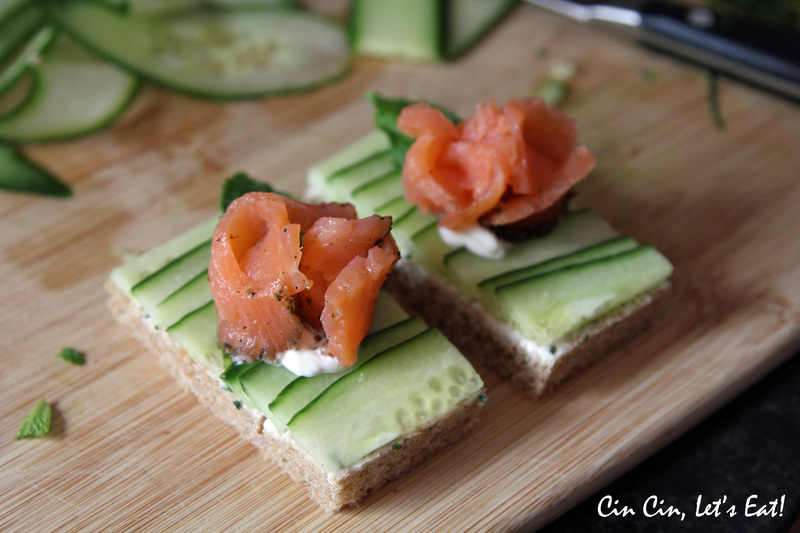 you can also dice them into strips and place a small mound of salmon on top of the bread. garnish with capers, chives, mint leaves…etc. A really easy way to make this is to just buy your favorite chicken or egg salad and serve them in endive cups. Since I’m not serving egg salad sandwiches this year like I usually do, I decided to add the eggs to the chicken salad and the rich yolky taste really accentuated the salad. I loosely follow Ina Garten’s recipe for Curried Chicken Salad and added 4 diced hardboiled eggs. Or check out this recipe from Food.com. Sometimes I like to add apples, and I prefer toasted almond slivers over cashews for the crunch. Wash the endive lettuce cups and towel dry. Right before serving, spoon 1 tbsp of chicken salad into endive cups. Optional garnish with chives, almond slivers, or raisins. Something for the vegetarian! This is another winner from the Barefoot Contessa. I have written a post about the Grapefuit & Avocado Salad last May. Here is the link to Barefoot Contessa‘s recipe. Instead of grapefruit and avocado slices, I diced them to be bite-sized so they are easier to spoon into the endive cups. Refrigerate the salad until nice and cold. Wash the endive lettuce cups and towel dry. Right before serving, spoon 1 tbsp of the salad into endive cups. This is from a post I saw from Pinterest, a site filled with ideas that I am very obsessed with right now. I found the mini pitas at Trader Joe’s. They were not as mini as I had envisioned but they did the job just fine. I drizzled some aged balsamic over the tomatoes and that was just the perfect icing on the cake. 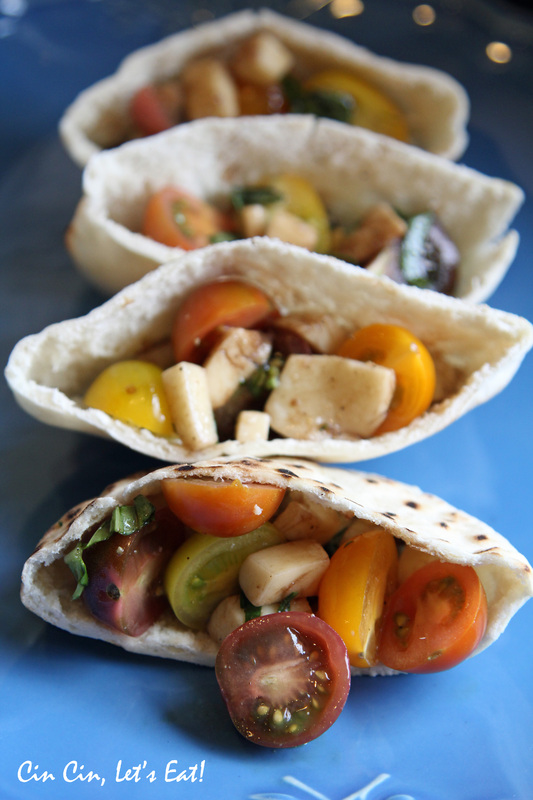 Substitute with regular cherry tomatoes if you cannot find baby heirlooms. I found them at Trader Joe’s (as usual). 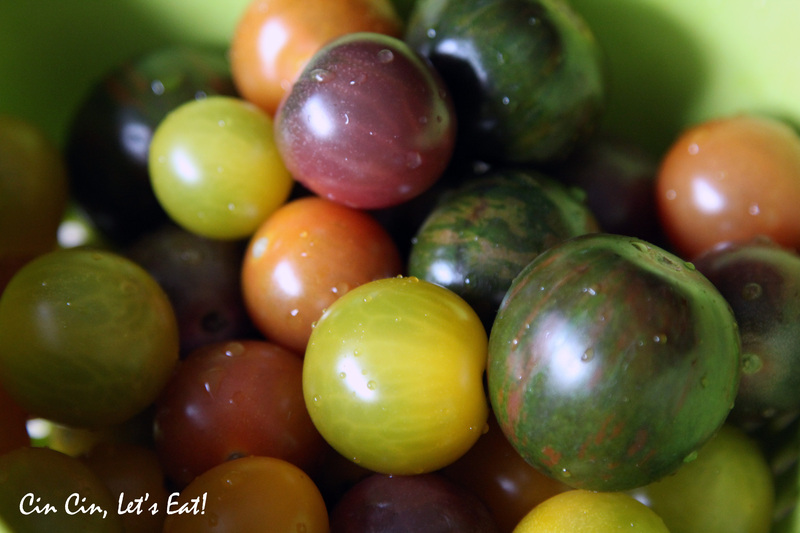 Baby heirlooms have a much fresher and sweet taste compare to regular cherry tomatoes. Saw this recipe from one of my favorite baked goods blog, Bake or Break, and I knew I had to make this. I will add even more nutella next time because the taste was so subtle that I needed more! But overall, a very easy recipe for a tasty cheesecake. Notes: to cut them into shapes, use a sharp knife, but if you want every slices to come out neatly, wipe the knife clean with a damp towel in between each cut. To make them into heart-shaped ones, I used a heart-shaped cookie cutter, but this is where it got tricky. You must soak the cutter in very hot water in between each cut. The heat will help the release of the cheesecake, otherwise you’ll end up with it being stuck inside the cookie cutter and you can’t exactly push it out with your fingers because fingerprint-indented cheesecakes aren’t so appetizing looking. This is a recipe from one of my favorite TV food personality – Miss Nadia G from Bitchin’ Kitchen. This was actually from the recent Vegan-focused episode. One of my friend follows a Buddhist vegetarian diet and doesn’t consume egg, I thought this would be a nice addition to the menu. I didn’t want to tell anyone that the chocolate filling was made with tofu because I didn’t want them to have biased opinions prior to taking a bite. This turned out to be a very tasty treat and vegan or not, I think you’ll enjoy it. 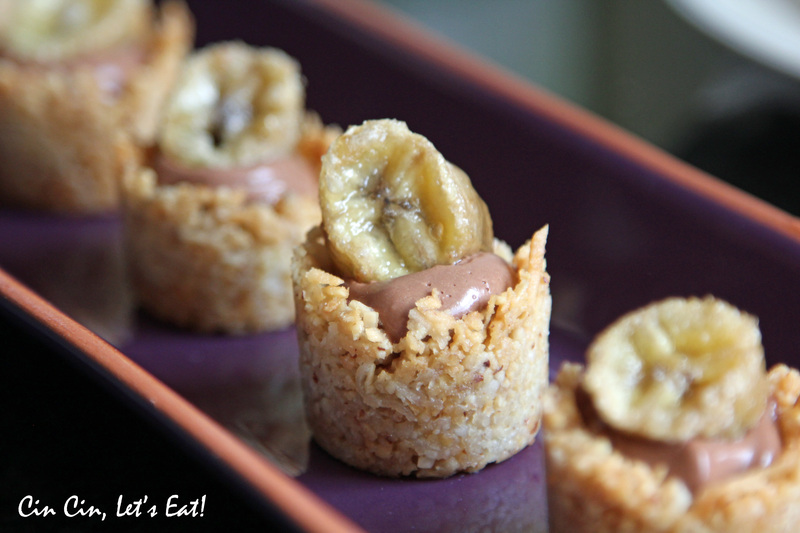 Notes: to make mini tarts, I used a silicon mini muffin mold. The shells crumble easily while warm, so it’s very difficult to remove from regular metal muffin mold. Using a silicon mold, the removal process was a breeze, simply a push from the bottom and the shells came right now. If you have mini tart or cheesecake mold, that will work perfectly as well, as long as it’s something with a removable bottom plate. My version wasn’t exactly vegan. I didn’t want to buy cocoa butter just for this, so I ended up just using regular butter. I also used regular 2% milk instead of soy milk. When I’m short on time, I always use store-bought pie dough. Here is a pretty great tart dough recipe that I like from Smitten Kitchen. 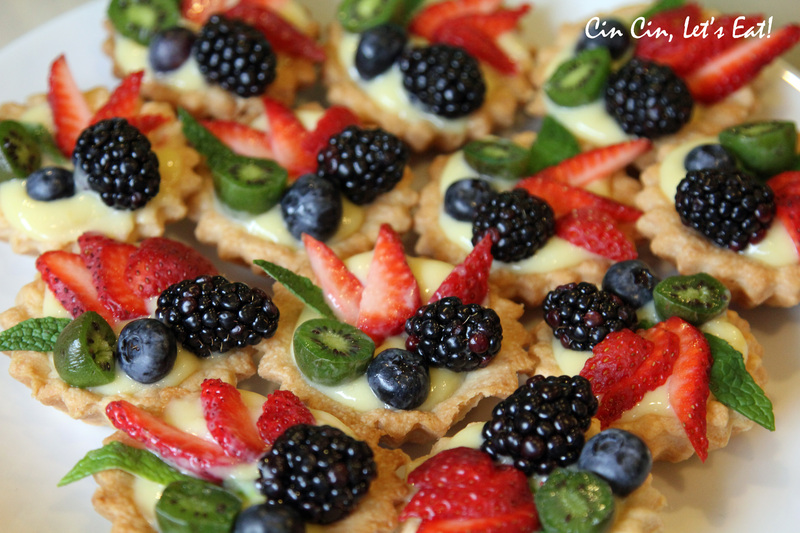 I baked them in mini tart molds until golden brown. Fill with lemon curd and decorate the top with berries. I tried out Alton Brown’s recipe for lemon curd for the first time and it was much easier than my usual favorite. I found these kiwi-berries in the store. 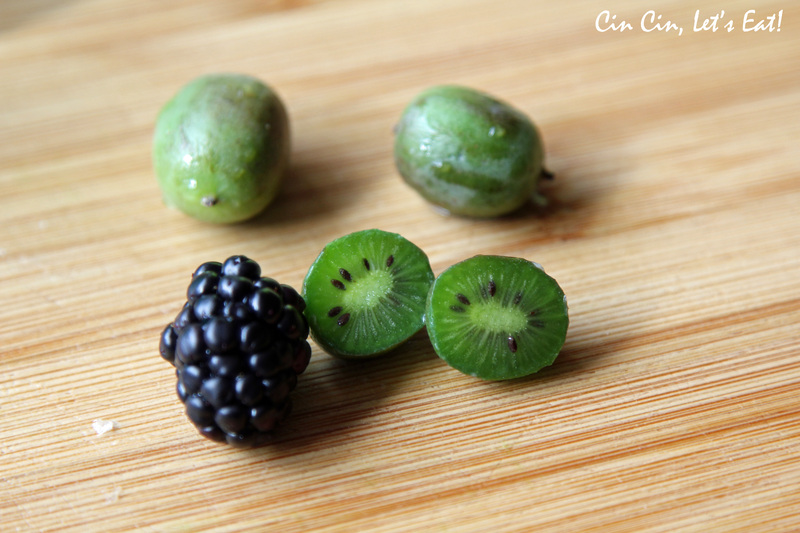 Miniature kiwis without the fuzzy skin. They taste just like kiwis too. How cool is that? 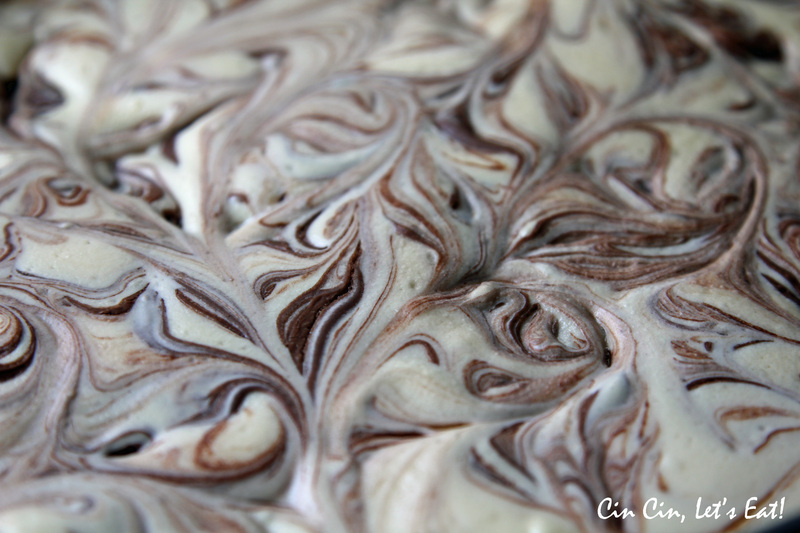 I’m going to do a separate post on this about the peanut butter buttercream. 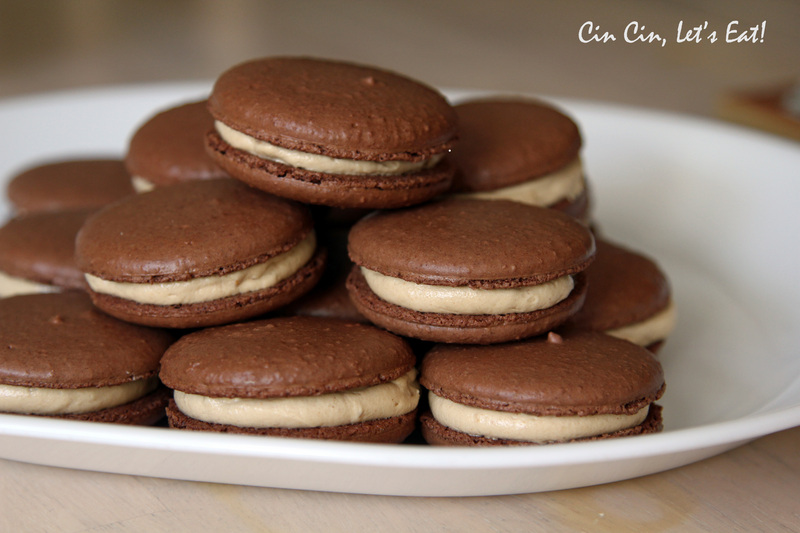 It was a basic chocolate macaron shell (not the best shells I’ve made) with the most delicious peanut butter buttercream, ever! I’ll finish that post soon, I promise! They are all so pretty! 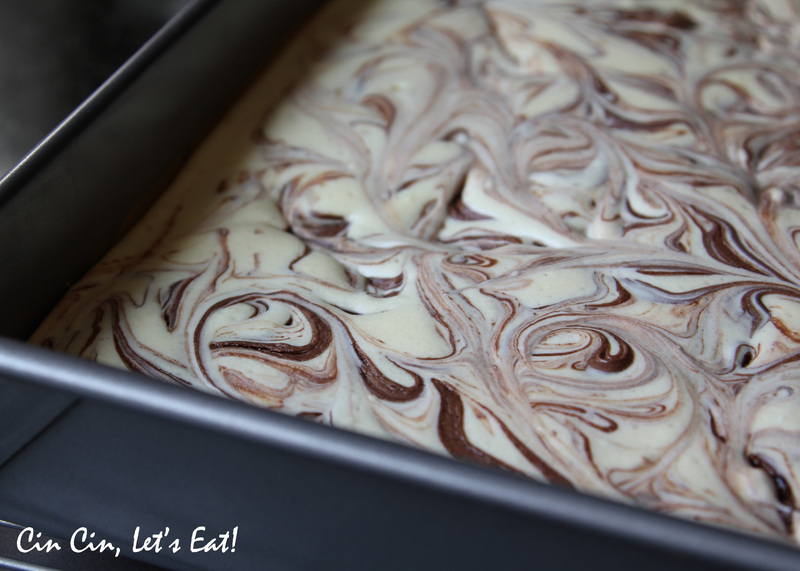 Particularly that nutella swirled cheesecake – OMG. You are such an awesome entertainer! what store did you get those kiwiberries from? i’m drooling all over again! OK, I have been dreaming about the macaroons ever since Joe brought them in. Seriously. Dreaming. The photos here are gorgeous and you are obviously gifted. Really, really gifted. Keep it up! Pingback: Baby Rattle Cupcakes [recipe] | Cin Cin, Let's Eat!